Although football season has been long over, don’t fret! With Spring in full bloom, a glimpse of Auburn Football is quickly approaching. 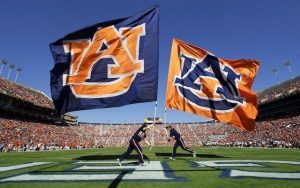 Auburn’s annual spring football game, A-Day, presented by Golden Flake, will kick off at 3 p.m. CT at Jordan-Hare S tadium on Saturday, April 13th. For those of you who may be new to the area, each Spring, a Founder’s Day celebration is held in Auburn. As part of this celebration, the football team plays a scrimmage game that gives Auburn fans a chance to preview the Tigers before the fall (A-Day)! If you are an avid A-Day lover ever since your glory days at Auburn University or a newbie in the area looking for some sweet Auburn tradition, come out and enjoy everything that A-Day has to offer! From white tent rentals, an abundance of food options from vendors, on campus dining, and food trucks, beverage stations, kid-friendly activities on the green space, and plenty of room to run around with the family, A-Day has something for just about everyone. Tickets are now on sale through the University’s ticket office. The General admission tickets are $5 per person and students get in FREE with a valid Auburn Ignited card. 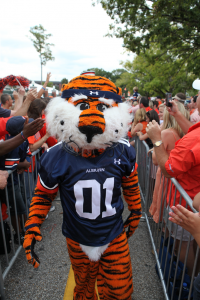 Tickets are also available on the day of the game from 8 a.m. to 4:30 p.m. at the Auburn Ticket Office. In addition, The Tigers will hold a postgame autograph session on Pat Dye Field immediately following the conclusion of the scrimmage where fans will be limited to one item per person. You can follow the link below to purchase your tickets in advanced!